Our first Grand Basset Griffon Vendeen. Until Gertie arrived we thought we had a dog proof garden, after all, our escape artist of an English Springer Spaniel had never managed to escape. Although Gertie was no bigger than an ESS she had an amazing jumping power and was able to jump our fencing at point blank range. The whole garden had to be re-fenced! Gertie was a very independent lady, who would have been just as happy living in a kennel as living in the comfort of our home. She was very much a creature of routine to the extent that she would not eat her dinner if you gave it to her too early or late. She was definitely Queen Bee of our pack. She only had to give the other dogs one of her looks and they immediately side stepped her. She had many expressions that she used to let you know what she wanted or expected of you. It was almost as if she could talk! Her sense of smell was phenomenal, she knew whether friend, foe or squirrel were passing the house even though she couldn't see them. Her nose would lift into the air, and if a friend her tail would wag, else she would give her houndy bay. Gertie had one litter from which we kept Bramble. It was with great sadness that we said goodbye to her, the day before her 13th birthday. 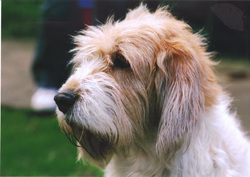 She was a lovely Mother, Grandmother and friend to our Clumber puppy Phoebe.